TAXI drivers say they are outraged at a decision of private hire company to reduce its minimum fare. SN1 Cars reduced its minimum fare for a half-mile journey from £3.80 to £3 on Monday. Its drivers say it will lead to less money in their pockets and drivers from rival companies say it will lead to increased competition. About 20 drivers from SN1 Cars, V Cars, United, Swindon Airport Cars and Hackney Cab drivers met to discuss the move, as well as other issues affecting their income, yesterday. Nick Chambers, who has been a taxi driver for 10 years, said: “Private hire taxi drivers are outraged by a decision that has been made without any prior consultation with the drivers, to reduce the minimum fare to £3 from £3.80. 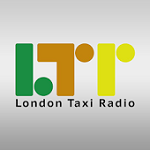 “This will greatly reduce their incomes and it comes at the same time as radio rent was also put up again with no consultation from drivers. Other taxi drivers, including Russell Read, also raised concerns about the number of licences handed out by Swindon Council and the rent for radio, which averages at £90. “We are not asking for special treatment as we have all chosen this particular employment,” he said. “What we are asking for is the same fair working conditions all people in this country supposedly have the right to. “That income is not put down by management with no consultation, those working hours are not raised without consultation, those staff levels are not allowed to get so high that the work level just isn’t there. Martyn Newson, the proprietor of SN1 Cars, said: “The minimum fare has been reduced for a journey which represents half a mile. “This was designed because we get OAPs really unable to walk. They have short journeys, perhaps 200 yards up the road, and I just think charging people doing this sort of journey £3.80 is exactly fair. A Swindon Borough Council spokesman said: “The limit on the numbers of Hackney Carriage vehicles in Swindon was lifted in 2006 in line with Government guidance. “As a result, we no longer have the power to limit the number of Hackney Carriage vehicle licences issued. “The council has no legal authority to refuse to issue licences to Private Hire drivers and Private Hire vehicles, providing the council’s licensing criteria is met. TAXI fares are set for a shock eight per cent rise in Gloucester – despite some drivers protesting that it would damage trade. Gloucester City Council is to hike up the charges more than twice the rate of inflation, causing a rift between two different bodies representing cabbies. AGAINST: Derek McKeown, of Associated Taxis. The huge rises, which are set to come into force from February, will add £1.80 to trips of 10 miles or more at peak times. 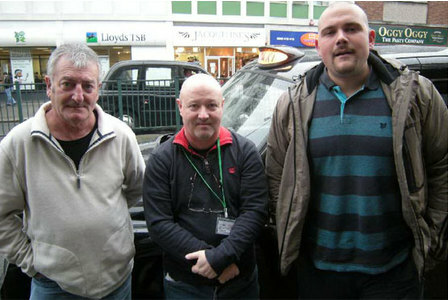 Gloucester Hackney Carriage Association (GCHA), which represents 76 of the city’s 137 drivers, has asked for the eight per cent rise following fears some members would be put out of business due to rocketing fuel and insurance. But Associated Taxis, a private company which 33 hackney carriages belong to, has objected on the grounds the rise is “too much”. But that view was not shared elsewhere. Zeya Amhed, chairman of the GCHA, said: “Our drivers have been asking for a rise and now is the right time. “We agreed to a freeze in May 2011 and since then fuel has gone up, and insurance is up as much as 30 or 40 per cent. Under the plan, journeys of up to two miles would go up by 20p, while trips of three to four miles will increase by 40p. Five mile trips would rise by 60p between 7-9am, which is off peak, and 80p at any other time. The city council’s licensing committee will make a decision on Tuesday – it meets from 6.30pm at North Warehouse. Lisa Wilkes, licensing officer, said the figure came about after the GCHA asked for it. A TONBRIDGE taxi firm owner is calling for action to combat unscrupulous cab drivers he says are plaguing the town. Terry Hill, proprietor of Castle Cars for 17 years, was incensed with the “obscene” overcharging by a handful of independent drivers over the holiday period. Mr Hill, 51, of Gorham Drive, said: “A few independents are blatantly ripping people off. “It has been going on for a long time, but it got a lot worse over Christmas,” he added. Mr Hill said he had heard reports of £40 fares being charged from Tonbridge railway station to Hildenborough, a journey that should cost no more than £10. 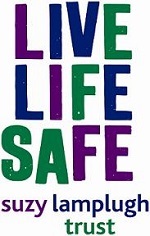 Another alleged incident saw an abusive driver take a couple back to the cab rank from their destination in Brook Street when they refused to pay an inflated fare. Mr Hill was so angered by recent developments he even put up posters displaying Tonbridge and Malling Borough Council’s official fare tariff in a bid to stop overcharging. He is now calling on passengers who believe they have been overcharged to report incidents to the council’s licensing department. “There is a small number of people on the Tonbridge taxi rank that are refusing to take people without payment up front, refusing to take minimum fares, seriously overcharging or refusing to give change,” he said. “Legitimate companies want something done about it as it is giving the trade as a whole a diabolical name. Tonbridge and Malling Borough Council’s chief solicitor Adrian Stanfield said: “The council takes the enforcement of taxi matters seriously and thoroughly investigates any complaints. “We have not received any complaints over the holiday period in relation to overcharging. All taxi meters are subject to external testing and calibration to ensure that all charges are in accordance with those set by the borough council. TAXI drivers have claimed a new fare chart proposed by Guildford Borough Council will threaten their livelihoods. The authority agreed at a licensing meeting on Wednesday (January 4) that its proposed methodology to decide fare increases was accurate and based on strong calculations with supportive evidence. But Mark Rostron, vice-chairman and secretary of Guildford Hackney Association (GHA), believes the borough’s calculations are not suitable and will result in a loss of money made by cabbies in the crucial first six miles of journeys. Speaking after the meeting, Mr Rostron said a large percentage of his journeys were under six miles, and with extra costs for fuel surcharges and excess passengers taken away in the proposals, his earnings would reduce despite the council increasing the tariff for the first 16 miles. The 50p extra for passengers will apply only for more than four, eliminating saloon cars, which Mr Rostron and many other cabbies own. “The formula that they are using is without merit,” he added. Mr Rostron also believes the borough’s 35% estimation for dead mileage, which is driving without a paying passenger, is too low and should be around 50-60%. The council’s proposals came in response to taxi drivers in Guildford using a London-based fare increase of 2.7%, which the authority believed was unfair for residents and was not based on solid factual evidence. There will now be a three-month consultation period for cabbies and the public to address the suggested methodology and bring forward any responses. “We really do want the taxi drivers to know that we are on board and that we are listening to them,” said Councillor Matt Furniss, chairman of the licensing committee. Another problem Mr Rostron foresees is that the taxi fleet is too large, due to more drivers being licensed in order to reduce waiting times to zero at peak hours. While this has worked, it has increased the number of cars during off-peak hours, meaning a lot of drivers who are self-employed finding jobs less available. Members of the GHA may still stage a peaceful protest as the Olympic torch passes through Guildford next year if the council does not satisfy their demands, but Mr Rostron hopes it does not come to that. A BID by taxi drivers in St Albans to increase their income by calling for fare extras to be introduced was thrown out by councillors last night. Members of St Albans District Council’s licensing regulatory committee came together with the St Albans and Harpenden Taxi Association to consider the request. The taxi drivers say some of the bigger cars, for example seven seaters, should be able to charge extra for carrying two or more persons as the vehicle is more expensive to run. However councillors on the committee disagreed and rejected their calls. 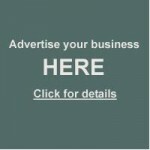 The drivers had also asked for the outside of the cars to carry adverts for local businesses but this was also refused. Mudassar Yason, secretary of the drivers’ association, said although their calls for fare extras were rejected, the cabbies were glad some other issues were resolved. 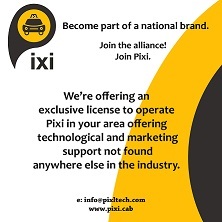 He added that an agreement was reached about advertisements inside the cabs and to help reduce carbon emmisions no cars below a 1.7 diesel engine would now be granted a licence. He said: “With the fare extras I guess the decision was fine. At the end of the day we could have gone for a fare increase but we understand that people say the last increase was extortinate and we have lost a few customers because of this. TAXI drivers in Guildford will protest as the Olympic Torch passes through the town next July if their complaints are not listened to by Surrey County Council. The Guildford Hackney Association (GHA) wants a fare increase of 2.7% to be implemented plus new rules to stop unlicensed private cabs picking up passengers. The peaceful demonstrations will not disrupt the taxi service in Guildford but it is hoped by the GHA that it will be seen in front of the world’s cameras. “We are not being listened to,” said David Williams-Wynn, chairman of GHA, who has been a Guildford cabbie for 37 years. Mr Williams-Wynn said the costs of running a taxi service had spiralled out of proportion due to increasing costs in fuel, car repairs and paying £536 per cab each year to be able to collect fares from the railway station. Surrey County Council will hold a licensing meeting on Wednesday, January 4 to decide whether the tariff used by GHA to come up with the 2.7% proposed increase is justified. The council said it was not opposed to any fare increase if it was deserved, but has asked for evidence about why the rise, based on London taxi fare increases, is legitimate. Councillor Matt Furniss, chairman of the licensing committee, said the council wanted to come up with a methodology that actually reflected Guildford prices. The evidence the authority needs is based on fuel costs, car maintenance, mileage and cost per mile among other aspects. However, Mr Williams-Wynn said that the fare increase was accepted earlier this year, but the council was now asking for evidence before it goes through, which he said was unexpected. When asking for the minutes from that meeting, Mr Williams-Wynn said the council could not produce them. “It is all very bizarre,” he added. Cllr David Goodwin, vice-chairman of the licensing committee, confirmed there were no recorded minutes from the meeting earlier this year, however, he pointed out that as there were no Guildford borough councillors present, no formal decisions on taxi fares could have been made. “Those decisions have to come from a licensing committee,” he added. Mr Williams-Wynn believes basing prices on London fares is appropriate because the capital has a much larger fleet of vehicles and Guildford cabbies rack up almost twice as much dead mileage, which is driving without a paying passenger. The GHA also believes the council is not dealing with the issue of private hire cars picking up passengers wherever they want, as opposed to when they are allowed to. The association claimed evidence of this had not been accepted by the county council. For more information on the planned protests, visit www.taxi-driver.co.uk. TAXI drivers across the district have called on the council to increase fares, by adding extras charges, due to rising fuel and insurance costs. Hackney Carriage licensed drivers, who form the St Albans and Harpenden Taxi Association (SAHTA), have been complaining for the last year about the high number of licences handed out by the district council. The cabbies say there are already too many taxis on the roads, which is creating a competition for fares. They have asked the district council to put a cap on licences. However when the council refused earlier this year, the drivers staged demonstrations to get their messages across. Their next plea to the council is to include extras charges in the fare, which were excluded during last year’s fare rise, for having more than two people in a taxi at a time. The drivers feel this will help boost their income. The committee adds: “Taxi drivers are also being severely hit by the ever increasing fuel and insurance. 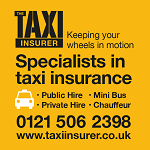 Taxi insurance is going up at an alarming rate due to many companies having to pull out of the taxi insurance trade. The drivers acknowledge the recession has reduced public spending but feel drivers with larger taxis have lost out since the fare extras were excluded. However the council’s licensing and regulatory committee has recommended the proposals are declined because the fare increase agreed in January 2011, was approved on an agreement that the extra charges were removed. 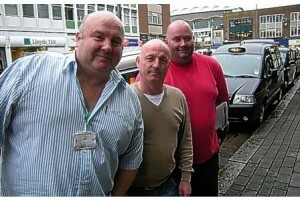 TAXI fares in Southamptonwill be slashed this Christmas after a single cabbie scuppered the goodwill gesture last year. Traditional double fares from 11pm on Christmas Eve to 6am on December 27 will be cut to time-and-a-half. Taxi chiefs hope the move will boost trade as well as offering some cheer to hard-pressed customers. Taxi trade bodies had hoped to bring in the reduced fares last Christmas but a lone taxi driver objected, triggering a licensing meeting which delayed the change. Marc Smith, 50, said the festive gesture was “truly bizarre” and claimed many passengers did not care what they were charged to get home from a night out in the city at Christmas. He said drivers deserved the higher premium for working Christmas holidays. Double fares from 11pm on New Year’s Eve until 6am on New Year’s Day will remain. TAXIMETERS will be installed in Fenland’s hackney carriages after councillors shrugged off a 500-signature petition today. Councillors were presented with the petition, which objected to the fitting of taximeters, at today’s meeting of Fenland District Council. Lisa Corbett, speaking on behalf of Bev’s Taxis in Wisbech, said that, in a survey they had conducted, 500 people voted against meters with only five in favour. She said: “We are in a very deep recession and I will quote council leader Alan Melton himself who said that times are tough and money is tight. But a recommendation to adopt the new Hackney Carriage and Private Hire Policy was approved, with only Independents Mark Archer and Virginia and Michael Bucknor voting against the plans. Councillor Kit Owen, FDC’s portfolio holder for transport, said the old charging policies were “outdated” and taximeters would create “a level playing field for all hackney carriage drivers”. He said meters would prevent overcharging and taxi drivers would still have the option of choosing to charge customers less than the price displayed. Cllr Owen quashed pleas from Councillors Archer and Virginia Bucknor for the council to defer the decision to allow more consultation with taxi drivers. Cllr Virginia Bucknor said: “My experience is that in 26 years of living in Wisbech I have never been overcharged, in fact sometimes I’ve been quite shocked at how little I was charged. “With roadworks now in Wisbech there will be a lot of traffic around the main roundabouts. I know so many people use taxis to go shopping especially from the villages. “When meters are introduced it’s going to put the fares up. If they get held up in the middle of Wisbech, as is inevitable, the fare will be increased. Councillor Philip Hatton spoke in support of taximeters, claiming that he had been a victim of overcharging, which was “rife” in the district. Meters will be installed in all hackney carriages by April. Wisbech & District Hackney Carriage Drivers’ Association Chairman Councillor Dave Patrick, who was absent from the debate because of the conflict of interest, said the decision opposed public feeling. He said: “They have not listened to the public’s wishes. I believe that the decision reached today will see some taxi drivers charging the full amount displayed on the meter. HACKNEY cab fares in the city have risen by an extra 50p per journey, which has been met with mixed feelings. Drivers are divided by the change in tariff, with some worried about losing custom in the current economic climate and others believing it is a realistic time to charge more as their prices go up. Gary Graham, aged 50, from Efford, disagrees with the rise. He said: “We should never have had it. I’m annoyed and I feel sorry for the public as they’ve got to pay for it. David Couch, aged 59, from Efford, has been a taxi driver for nine years and is frustrated about the increase and what it could do to business. He said: “Most of us are really annoyed about it; it’s the wrong time to do it and it’s totally and utterly not acceptable. Dave Feteridge, aged 52, from Stoke, also believes the change in tariff to be wrong. He said: “When a customer gets in the cab during the day the fare starts at £3, and then after 7pm it goes up to £3.50, so an extra 50p won’t be too bad. It’s the 50p at midnight that’s wrong. However, according to Plymouth City Council, The Plymouth Licensed Taxi Association (PTLA) requested that the council considered an increase to the tariff, as it is the council that sets the fares that Hackney Carriages can charge (this does not include private hire taxis). The tariff outlines the maximum rates a driver can charge in order to protect the consumer but drivers are able to downwardly negotiate their fares should they wish and journeys outside Plymouth can be negotiated further. The tariff was originally considered by the Licensing Committee on September 2 and a proposed new tariff was publicised via a public notice in The Herald as is required by the law. Three objections were received by the council so a further committee discussed the proposed tariff on November 17 where it was subsequently agreed and was introduced on December 1. The council said that the PLTA were consulted at each stage and presented their case at committee, which represent between half and a third of the licensees. A Plymouth City Council spokeswoman said: “Giving the exact increase is not easy, as the tariff was restructured and there are some changes to the list extras. However, it can be most simply described by giving the initial journey cost, which has increased by approximately 50p. Alan Heron, aged 65, from Derriford, agreed this may be the right to time to make such changes.